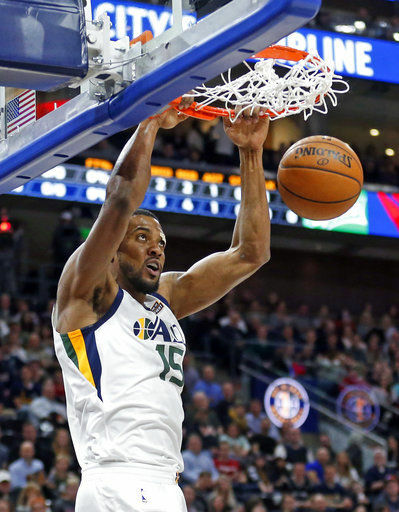 SALT LAKE CITY (AP) — Missing their leading scorer for the second consecutive game, the Utah Jazz needed Rodney Hood to score in bunches. He did exactly that, including 11 fourth-quarter points to help Utah end a three-game losing streak. 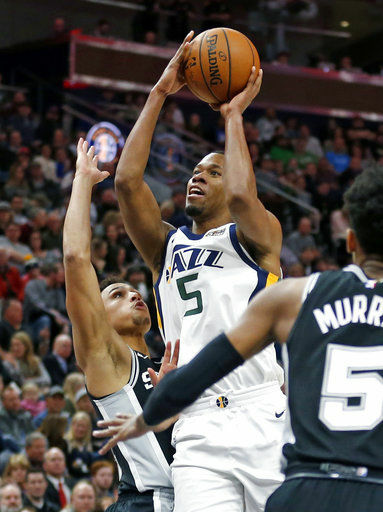 Hood had 29 points and the Jazz fended off multiple comeback attempts by San Antonio to beat the Spurs 100-89 on Thursday night. Utah played without rookie guard and top scorer Donovan Mitchell, who missed his second consecutive game with a bruised right big toe. “When Donovan is out, I have to be a lot more aggressive,” Hood said. 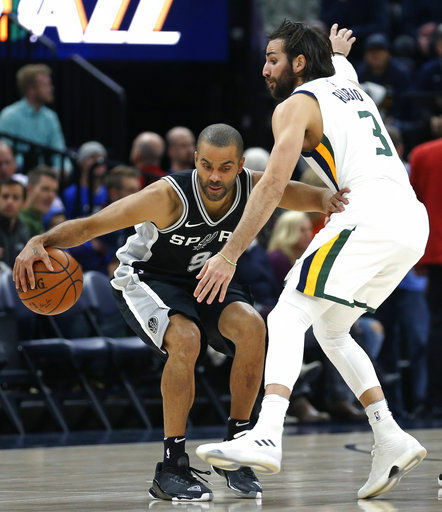 The Jazz led most of the way, but the Spurs fought back each time it appeared Utah was ready to put the game away. Hood took over in the fourth quarter after San Antonio cut the lead to 82-81. Utah went on a 13-2 run with Hood scoring nine straight points, including a contested pull-up 3-pointer from the corner and a spinning, mid-range jumper to push the lead to 12. 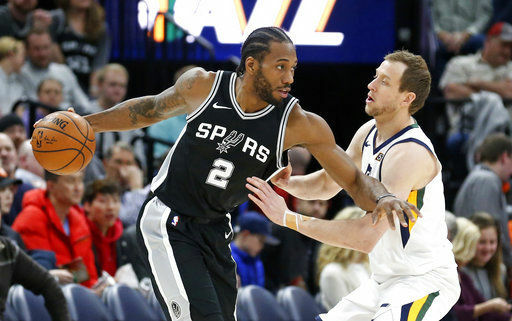 “You noticed he was pretty good, huh?” Spurs coach Gregg Popovich said. “I thought they did a really good job in pick-and-roll, attacking and getting the ball to really open shooters. The last two 3s he hit, they were contested pretty well and he made great shots. Ricky Rubio had 11 points and 11 rebounds, while Derrick Favors finished with 14 points and nine rebounds. Bryn Forbes led the Spurs with 12 points. The Jazz led 50-38 at halftime thanks to a 14-point half by Hood. Utah used a 17-3 run spanning the end of the first quarter and the beginning of the second, highlighted by back-to-back 3s from Joe Johnson and Rubio, to take a 30-17 lead. The Spurs opened the third quarter with an 11-1 run as LaMarcus Aldridge warmed up and cut the lead to two. San Antonio answered each time the Jazz tried to pull away before Hood finally sealed it. The loss broke a three-game winning streak for the Spurs. Spurs: Pau Gasol did not play due to a right groin injury. … Manu Ginobili sat out for rest. … Danny Green was held out due to a left groin injury. Jazz: Raul Neto missed his sixth straight game due to a concussion. 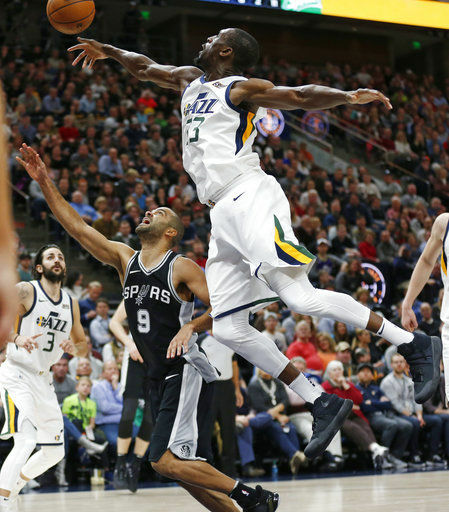 The Jazz returned from a six-game road trip against some of the most talented teams in the NBA, including the Celtics, Cavaliers, Rockets and Thunder. Utah went 1-5 during the trip. Coming home is nice, but the Jazz were still on the second night of a back-to-back and down two starters. Aldridge is having his best season since joining the Spurs before the 2015-16 season. He entered averaging team highs of 22.3 points and 8.4 rebounds per game. The five-time All-Star was the only individual player Popovich mentioned when asked what he likes about his team to this point. “I love that LaMarcus is having such a great year,” Popovich said. “He’s been just outstanding at both ends of the floor and really been the main factor in keeping our heads above the water. Spurs: Visit the struggling Sacramento Kings on Saturday. Jazz: Host reigning MVP Russell Westbrook and the Oklahoma City Thunder on Saturday.